Every email client displays HTML a little differently. A campaign that looks perfect in Gmail may appear odd in Microsoft Outlook. Before you send, use Inbox Preview to avoid unpleasant surprises and adapt your designs to work best with your audience's top email clients. In this article, you'll learn how to use Inbox Preview. Inbox Preview is accessible in the Campaign Builder and the Template Builder. To see which clients are popular with your contacts, you’ll need to choose your recipients before you run an Inbox Preview. This feature relies on audience data and isn’t available in the Template Builder or in draft campaigns without a chosen audience. Inbox Preview is a Litmus-powered tool that generates screenshots of how your campaign will appear in different email clients on various devices. Test every client, or just the ones that are the most popular with your contacts. Inbox Preview also includes a color blind view, so you can make sure your content is accessible. Monthly Mailchimp accounts receive 25 Inbox Preview tokens each month, and Mailchimp Pro accounts receive 100. Each time you create or update a preview, the cost is one token. For example, if you run an Inbox Preview for Outlook 2015, Gmail for Chrome, and Apple Mail 11, the cost is three tokens. Unused tokens expire at the end of each billing cycle. If you run out of tokens but need more previews, you may want to sign up for a Litmus account. All Mailchimp users receive their first 30 days of Litmus for free. To test a campaign in Litmus, you’ll need to save your template and export it as HTML. 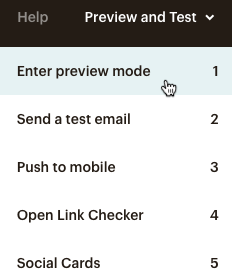 Mailchimp also offers a few other ways to test your campaigns. To run an Inbox Preview on your campaign, follow these steps. On the Design step, click the Preview and Test drop-down menu and choose Enter preview mode. In Preview Mode, click the Inbox tab. In the Choose clients pane, check the boxes next to the names of the email clients you want to preview. Each email client you choose will cost one token per preview. When you run an Inbox Preview in a campaign for the first time, we'll pre-select the 10 most popular email clients across Mailchimp. If you've previously sent to your audience, click Top Client usage from your audience to view your subscribers' preferred email clients. 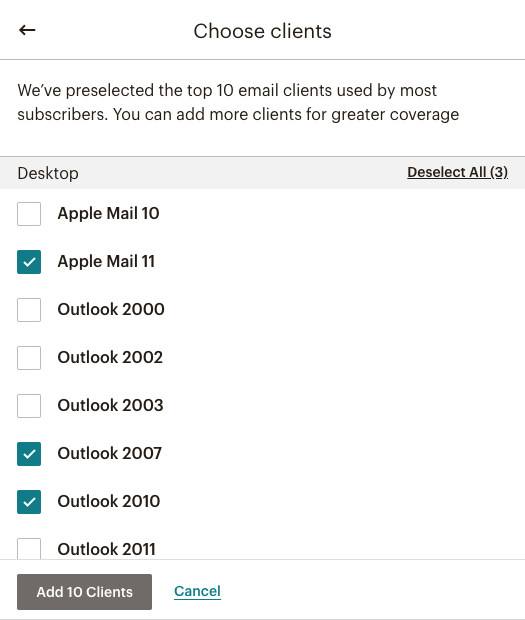 After you choose the email clients you want to preview, click the Add Clients button. It may take a minute for your Inbox Preview to load. We'll display a processing icon next to previews that are in progress. Click an email client to view its preview. When you're done reviewing your previews, click X in the upper-right corner to exit Preview Mode. After you fix any issues you saw with your campaign, run an Inbox Preview update to see how your changes appear. Run an update to refresh Inbox Previews of your draft campaign in various email clients. Each email client you update will cost one token per preview. To update an Inbox Preview, follow these steps. On the Design step, click the Preview and Test drop-down menu, and choose Enter preview mode. In Preview Mode, click the Inbox tab to open Inbox Preview. Check the the box next to the names of any email clients that you want to see updated previews for. To refresh the previews, click Update. After your update loads, click an email client to view its updated preview. To see what the preview for an email client looked like before you updated it, click View history. 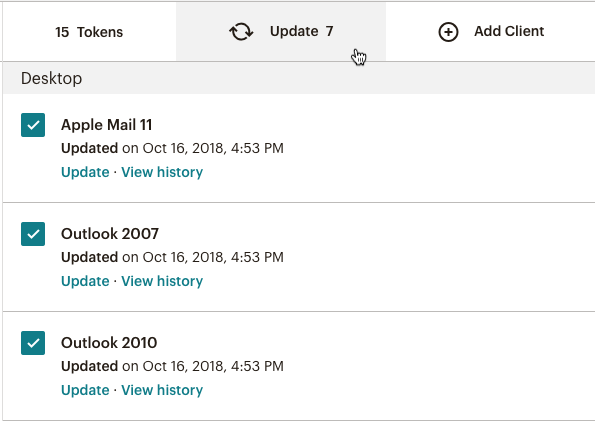 If you’re out of tokens or don’t have access to Inbox Preview, there are a few other ways you can preview and test your campaign. Compare your content on desktop versus mobile. Click the tabs in Preview Mode to see the difference, and toggle the slider to view live merge tag info. Send a test email See how your campaign will look in your own inbox, or share your draft with your colleagues. You can send a limited number of test emails each day, depending on your account type. If you’ve enabled push notifications, you can send a mobile preview of your draft to the Mailchimp app on your device. Testing is always a good idea. Learn general email testing tips, troubleshooting specifics, and testing with Inbox Preview. We recommend that you always preview and test your campaign before sending to your subscribers.